For the 1936 murder on the S.S. Point Lobos, see Earl King, Ernest Ramsay, and Frank Conner. Point Lobos and the Point Lobos State Natural Reserve is the "crown jewel" of California’s 280 state parks. It has two adjoining marine protected areas, Point Lobos State Marine Reserve (SMR) and Point Lobos State Marine Conservation Area (SMCA). Point Lobos is just south of Carmel-by-the-Sea, California, United States, at the north end of the Big Sur coast of the Pacific Ocean. Looking north over Whaler's Cove, the largest of a number of coves in Point Lobos, and the location of Whalers Cabin. Point Lobos contains a number of hiking trails, many next to the ocean, and a smaller number of beaches. It is the site of a historic marine reserve, which was expanded in 2007. It is also the home to a museum on whaling, which includes a historic building once used by area fishermen. The longstanding wildlife protection and scenic seascape have led to Point Lobos' reputation as an unparalleled local recreational scuba diving destination. In 1896, the Carmelo Land and Coal Company subdivided the land into 1,000 lots and named the new town "Carmelito". Engineer Alexander Allan purchased the land and over many years bought back the lots that had been sold and erased the subdivision from the county records. As of 2017[update], more than one million annual visitors from around the world visited Point Lobos, which is restricted by only 150 on-site parking spaces. The majority of visitors must park on the shoulder of Highway 1 and walk into the reserve. The Point Lobos area is geologically unique and contains a rich and diverse plant and animal life both on shore and in the water. Called the "greatest meeting of land and water in the world" by landscape artist Francis McComas, Point Lobos is considered a crown jewel in the California state park system. The geological history of Point Lobos describes the rocks that create the headlands and inlets that make Point Lobos famous. The Carmel submarine canyon lies just north of Point Lobos. Like Monterey Canyon to the north the canyon provides cold, nutrient-rich water to the surface during upwelling events. These nutrient rich waters fuel the high primary productivity seen in Carmel and Monterey Bays, which in turn support the high diversity of life observed in the water and on land at Point Lobos. The large number of visitors is causing erosion in some places. The Point Lobos Foundation has coordinated volunteer days with the goal of planting hundreds of native species to restore eroded areas. Point Lobos is one of only two places where the Monterey Cypress are native. The waters around Point Lobos contain extensive kelp forests. It's possible for visitors to watch whales off shore during certain portions of the year as they migrate along the coast. Gray, Humpback, and Blue Whales are regular visitors to the area. The reserve has several miles of trails. Visitors can view the coastal scenery, explore the coast, and picnic. California's marine protected areas encourage recreational and educational uses of the ocean. The quality of the underwater environment in the adjacent marine protected areas draws a large number of scuba divers. Whaler's Cover is often used by divers to begin their dives. Other activities include kayaking and snorkeling. Point Lobos State Natural Reserve is planning to reduce overcrowding by requiring visitors to obtain reservations at peak times. The Ohlone people harvested shellfish including abalone from the waters around Point Lobos. Evidence has been found of a long-term village named Ichxenta, in a meadow near San Jose Creek adjacent to Point Lobos, that indicates the natives inhabited the area for about 2,500 years. The village meadow is currently known as the Polo Field. There are 19 midden sites within Point Lobos and five sites containing mortar holes used by the natives for grinding acorns and seeds. It's likely that Sebastian Viscaino or some of his soldiers, who camped near the mouth of the Carmel River in 1602-03, may have visited the area to the south. Gaspar de Portolà and his exploring party camped at San Jose Creek in October 1769. Sergeant Jose Francisco Ortega conducted a study of the coast south of the Carmel River. :37 In about 1770, Spanish Vaqueros from nearby Carmel Mission ran large herds of cattle in the area near Point Lobos. 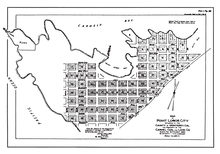 Governor Juan Alvarado granted Rancho San Jose y Sur Chiquito, two square leagues of land, in 1839 to Marcelino Escobar, Alcalde (or mayor) of Monterey, Alta California. The grant was from the south side of Carmel River, including Point Lobos, 11 miles (18 km) south to Palo Colorado Canyon. Two of Escobar’s sons, Juan and Agustin, obtained possession of the rancho shortly afterward, and sold it on August 26, 1841 to Doňa Maria Josefa de Abrego for about three cents a acre. She held power of attorney for her husband to buy and sell land. She paid $250, one-half in silver, and one-half in gold. Ownership of Point Lobos was later complicated by the fact that when Juan and Augustin Escobar sold the rancho to Josefa de Abrego in 1841, they didn't obtain permission from their multiple brothers and sisters. The siblings later contested the sale. Under somewhat mysterious circumstances, on January 16, 1843, Maria Abrego deeded the rancho to a group of about 10 soldiers from the Monterey Presidio. Records confirm the soldiers paid nothing, and a legend attached to the transfer says a gambler lost a rancho in a card game. Her husband was known for his gambling habit. On June 7, 1844, the soldiers turned the Rancho over to their superior officer, Colonel José Castro, former Governor Alvarado's brother-in-law. 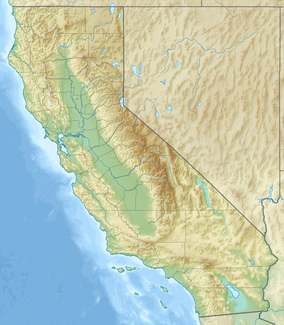 After the Mexican–American War, Mexico ceded California to the United States. The 1848 Treaty of Guadalupe Hidalgo provided that the land grants would be honored. But the Land Act of 1851 required owners to prove their ownership. Castro filed a claim on February 2, 1853, but grew impatient with the outcome and sold the land in 1854 to Joseph S. Emery and Abner Bassett for $700, leaving to them the legal fight for ownership. The commission denied Castro's claim on August 28, 1855. Castro died in 1860. Emery and Bassett appealed the court's ruling. Bassett died in 1874, leaving his undivided one-half interest to his wife and eight children. Their half of the rancho was appraised at $15,000. In 1880, a lawsuit was filed in United States District Court to resolve the conflicting claims of more than two dozen putative property owners and squatters. On June 5, 1882, subject to confirmation of the original claim by Castro, the judges divided Escobar’s original land grant into 34 parcels. Later that year, Castro's original claim was validated by the court. The title was confirmed on December 24, 1885, and President Grover Cleveland signed the land patent on May 4, 1888, 35 years after Castro's initial filing. All of the 34 claims from the 1880 lawsuit were invalidated as a result. In 1851 a Chinese sailor, Quock Junk, ran aground at Point Lobos. He was rescued by members of the Ohlone tribe. He was later joined by four or five other Chinese families who built cottages at Whaler's Cove. They became the first commercial fishermen at the point. From 1854-1858, a granite quarry was operated at what was later named Whaler’s Cove. The granite was used to build the Old Monterey Jail, San Francisco Mint, portions of Fort Point, and buildings on the Navy’s installation at Mare Island Naval Shipyard. In 1862, Antonio Victorine, a Portuguese whaler from the Azores, arrived at Point Lobos, following the whale population. About fifty to seventy family members lived at Whaler's Cove. The men spotted whales from Whaler's Knoll and then rowed off shore about 1 mile (1.6 km) in 24-foot boats to harpoon the whales. They towed the whales back to Pt. Lobos to fleece and harvest the blubber. They then towed the carcasses back out to sea. 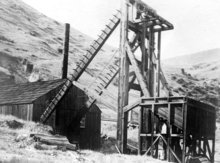 Headstock of the Carmelo Land and Coal Company mine in upper Malpaso Canyon, south of Carmel, California, in 1895. In 1874, a seam of low grade bituminous coal was found in upper Malpaso Canyon, southeast of Pt Lobos. On September 6, 1888, shortly after the patent for Rancho San Jose y Sur Chiquito was approved, almost all of the owners banded together to form the Carmelo Land and Coal Company. In exchange for shares in the company, they sold their interest in the land for $1. A mine was dug into the mountain near Malpaso Creek, and the coal was transported on ore carts via a tramway to Coal Chute Point, opposite the Chinese settlement at Whaler's Cove. The deep water allowed the workers to use the chute to deliver the coal directly to coastal steamers. By 1890, Emory and Bassett's heirs subdivided Point Lobos into 1,000 parcels. They begin selling lots for $25 to $50 to a new town they initially called Point Lobos City, but later renamed Carmelito. The lack of a bridge across the Carmel River and two national economic recessions during the 1890s combined to severely restrict sales. The outer portion of the point was reserved as the Point Lobos Park. Alexander MacMillan Allan, a successful engineer from Pennsylvania, was hired in 1897 to improve the coal mine operation. When the coal mine proved unprofitable, he purchased 640 acres (260 ha) of Point Lobos from the Carmelo Land and Coal Company in 1898. Marine biologist Gennosuke Kodani was already harvesting abalone from the area, a valuable delicacy in Japan. Allan partnered with him to build the Point Lobos Canning Company, which they operated until 1928. Allan decided to move the remainder of his family from Oakland to Point Lobos. Label from a can of abalone produced by the Point Lobos Canning Company in 1905. Allan added a sand and gravel mining operation to the Abalone cannery. In 1899 he had a narrow gauge railroad built from nearby San Jose Beach to Coal Chute Point to transport sand for shipment by sea to glass manufacturers in Alameda. Sand mining continued through 1954. Allan established the Point Lobos Dairy at the mouth of San Jose Creek which was operated from 1903 until 1954. He also became a successful race track architect and built the Santa Anita, Tanforan and Bay Meadows race tracks. One member of the family sold a portion they inherited to form the Carmel Meadows subdivision. In 1899, Allan and his wife Satie, who grew to appreciate the natural beauty of the point, were concerned about the increasing number of visitors. People had been visiting the point for many years to see the rare Monterey Cypress trees and enjoy the scenic coastline. The Allan family put up toll gates, prohibited camping, and charged visitors 50 cents a vehicle (about $10 today) to enter the point. Allan bought many of the residential lots that had been subdivided and later got the entire subdivision removed from the county record. Scientists reported to the government that the Carmel area including Point Lobos was the "most picturesque spot on the Pacific Coast." In 1925, Point Lobos figured prominently in discussions for inclusion in the new state park system. Members of the Sierra Club and the Save the Redwoods League discussed preserving Point Lobos and Cypress Point as national parks or reserves. Duncan McDuffie of the Save the Redwoods League hired the internationally known landscape architect Frederick Law Olmstead to research Point Lobos and report on the areas most noteworthy of preservation. Olmstead's report described Point Lobos as "the most outstanding example on the coast of California of picturesque rock and surf scenery in combination with unique vegetation, including typical Monterey cypress." Point Lobos gained the attention of the newly established California State Park system, who considered taking the land using eminent domain. Allan initially resisted the idea of making the land a public park. The family persuaded the state to wait until Allan died. On February 8, 1933, three years after Allan’s death, the Allan family sold 348 acres (141 ha) to the State of California for $631,000 (equivalent to $9,950,870 in 2018). The state promptly set about erasing evidence of human intrusion on the land, removing man-made structures like the abalone cannery, the railroad used to haul sand, and a number of homes and shacks, excepting a single Whalers Cabin. The Allan family donated an additional 15 acres (6.1 ha) to the state of cypress-covered headlands at the western tip of the point as a memorial grove to Alexander and Satie Morgan Allan. The state added another 50 acres (20 ha) later on, expanding the reserve to almost 400 acres (160 ha). At the beginning of World War II, a U.S. Army Coastal Defense Squad used the Whalers Cabin at Whaler's Cove for its headquarters. From 1942 to 1944, the cove was the site of a 4th Air Force Long-Range Radar site. Tents were set up to accommodate 90 men below Rat Hill. In July and August 1943, the U.S. Army established a training school for the 543rd Engineer Boat and Shore Regiment, 3rd Engineer Special Brigade, at Whaler's Cove at Point Lobos. The unit found that the cove was an ideal harbor for anchoring and maintaining their boats. The unit was later involved in 62 landings in the southwest Pacific. The Allan family retained the land to the east of Highway 1. Eunice Allan Riley, one of Alexander's three daughters, repurchased the last subdivided lots in the 1950s. In 1960, 750 acres (300 ha) underwater acres were added as the first marine reserve in the United States. The marine reserve was designated an ecological reserve in 1973, and in 1992, was added to the Monterey Bay National Marine Sanctuary, the largest in the nation. Whalers Cabin was built around 1850 as a fisherman's hut. The historic Whalers Cabin at Whaler's Cove was constructed in the 1850s to house Chinese and later Japanese fishermen. The Chinese used locally sourced pine and redwood for siding. The floor was originally dirt. The floor joists are supported by six whale vertebrae that rest on granite blocks quarried nearby. Originally, the floor was packed earth. There were originally about 10 cabins around the cove. The cabin may have been used by Portuguese whalers from the Azores, who harpooned whales off the coast and hauled their carcasses onshore at the cove. The Carmel Whaling Company operated from 1862 to 1879. From 1854 to the end of shore-based whaling in about 1900, there were only 16 shore whaling stations in California, with about 300 men involved. When kerosene oil was introduced in about 1880, whale oil became too expensive. Whaling was briefly reintroduced by the Japanese Whaling Company from 1898 to 1900. The original Point Lobos Ecological Reserve was created in 1973. As one of California's oldest and best known no-take reserves, its large and diverse fish populations make Point Lobos a hot spot for non-consumptive recreational diving. The Point Lobos marine protected areas provide shelter to a wide range of fish, invertebrates, birds, and marine mammals, from those that rely on the near-shore kelp forest to those that inhabit the deep waters of the Carmel Submarine Canyon. In 2007, the ecological reserve was expanded and renamed The Point Lobos State Marine Reserve and Point Lobos SMCA by the California Department of Fish and Game. A no-take zone was extended from the east side of Monastery Beach to the mouth of MalPaso Creek. They were two of 29 marine protected areas adopted during the first phase of the Marine Life Protection Act Initiative, a collaborative public process to create a statewide network of marine protected areas along the California coastline. Point Lobos SMR covers 5.36 square miles. The SMR protects all marine life within its boundaries. Fishing and take of all living marine resources is prohibited. Point Lobos SMCA covers 8.83 square miles. Harvest of all living marine resources is prohibited in the conservation area except the recreational and commercial take of salmon, albacore, and the commercial take of spot prawn. As specified by the Marine Life Protection Act, select marine protected areas along California's central coast are monitored by scientists to track their effectiveness and learn more about ocean health. Similar studies in marine protected areas located off of the Santa Barbara Channel Islands have already detected gradual improvements in fish size and number. A large number of movies have been made in or around Point Lobos. ^ "Point Lobos Foundation - Point Lobos Foundation". www.pointlobos.org. Retrieved 10 May 2018. ^ a b With almost one million visitors a year point lobos state park is dealing with the consequences of some of the footprints being left behind. KION. 19 Nov 2017. Retrieved 11 May 2018. ^ a b c Guara, Maria. "Point Lobos' natural beauty belies industrial past". SFGate. Retrieved 10 May 2018. ^ "WHALE swims by at Pt. Lobos on Jan 26! Photo by Clinton Bauder - Any Water Sports". 27 January 2013. ^ Department of Fish and Game. California Fish and Game Code section 2853 (b)(3) Archived 2013-03-26 at the Wayback Machine Marine Life Protection Act. Retrieved December 18, 2008. ^ a b c d e "The Allan Memorial Grove at Point Lobos State Reserve" (PDF). California State Parks. 2004. Retrieved 7 May 2018. ^ a b c d e Wiley, Marlene. "Point Lobos State Reserve". www.mnn.net. Retrieved 7 May 2018. ^ a b c d e f "Point Lobos History". www.pt-lobos.com. Retrieved 7 May 2018. ^ "Diseño del Rancho San José y Sur Chiquito: Calif". Calisphere. ^ "Report of the Surveyor General 1844–1886" (PDF). Archived from the original (PDF) on 2009-05-04. ^ Grimes, Teresa; Heumann, Leslie (January 7, 1997). "Historic Context Statement Carmel-by-the-Sea". ci.carmel.ca.us. Retrieved 30 December 2017. ^ "Allan House". Alliance of Monterey Area Preservationists. Retrieved 10 May 2018. ^ Walton, John (2003). Storied Land: Community and Memory in Monterey. Berkeley, Calif.: University of California Press. ISBN 978-0520227231. Retrieved 7 May 2018. ^ Hirahara, Naomi (2001). Distinguished Asian American business leaders (1. ed.). Phoenix, Ariz.: Oryx. pp. 104–106. ISBN 9781573563444. Retrieved 7 May 2018. ^ a b c d Rogers, Paul (2 December 2010). "Land deal near Point Lobos closes more than a century of preservation". The Mercury News. Retrieved 10 May 2018. ^ a b "Obituary Margaret M. Allan". Retrieved 10 May 2018. ^ "History of Point Lobos". pointlobos.org. Point Lobos Foundation. Archived from the original on August 8, 2004. Retrieved 7 May 2018. 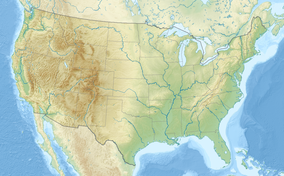 ^ "Map of Point Lobos Proposed California State Park, a part of Rancho San José y Sur Chiquito in Monterey County, Cal. - Price Estimate: $150 - $250". www.pbagalleries.com. Retrieved 8 May 2018. ^ Johnson, Jim (Oct 16, 2015). "Point Lobos Stone House demolition, development plans rankle neighbors". Monterey Herald. Retrieved 11 May 2018. ^ a b "Point Lobos History - Point Lobos Foundation". www.pointlobos.org. Retrieved 10 May 2018. ^ "Charles Wilson Spence's Obituary on The Augusta Chronicle". The Augusta Chronicle. ^ "Co. C, 543rd Engineer Boat and Shore Regiment, 3rd Engineer Special Brigade". www.justinmuseum.com. Retrieved 11 May 2018. ^ "3rd ESB Engineer Special Brigade, 533rd EB&SR, 543rd EB&SR, 593rd EB&SR". ebsr.net. Retrieved 11 May 2018. ^ a b "Whalers Cabin". Point Lobos Foundation. Archived from the original on Feb 3, 2015. Retrieved 5 June 2018. ^ Bertao, David. The Portuguese Shore Whalers of California, 1854-1904. San Jose, CA: Portuguese Heritage Publications, 2006. Page 106. ^ a b California Department of Fish and Game. California Marine Life Protection Act Initiative Summary of Central Coast MPAs as Adopted by the California Fish and Game Commission Retrieved on December 22, 2008. ^ a b California Department of Fish and Game. 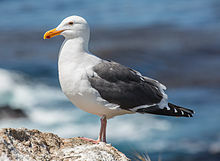 "Online Guide to California’s Central Coast Marine Protected Areas Retrieved on December 18, 2008. ^ Castell, Jenn, et al. How do patterns of abundance and size structure differ between fished and unfished waters in the Channel Islands? Results from SCUBA surveys. Partnership for Interdisciplinary Studies of Coastal Oceans (PISCO) at University of California, Santa Barbara and University of California, Santa Cruz; Channel Islands National Park. Retrieved December 18, 2008.